Definition at line 25 of file AArch64TargetMachine.h. Create an AArch64 architecture model. Definition at line 249 of file AArch64TargetMachine.cpp. References llvm::Disable, EnableGlobalISelAtO, llvm::TargetMachine::getMCAsmInfo(), llvm::TargetMachine::getOptLevel(), llvm::LLVMTargetMachine::initAsmInfo(), llvm::Triple::isOSBinFormatMachO(), llvm::TargetOptions::NoTrapAfterNoreturn, llvm::TargetMachine::setGlobalISel(), llvm::TargetMachine::setGlobalISelAbort(), llvm::TargetMachine::setMachineOutliner(), llvm::TargetMachine::setSupportsDefaultOutlining(), llvm::TargetOptions::TrapUnreachable, llvm::MCAsmInfo::usesWindowsCFI(), and ~AArch64TargetMachine(). Definition at line 398 of file AArch64TargetMachine.cpp. References llvm::TargetPassConfig::addIRPasses(), llvm::CodeGenOpt::Aggressive, llvm::cl::BOU_TRUE, llvm::cl::BOU_UNSET, BranchRelaxation, llvm::BranchRelaxationPassID, llvm::createAArch64A53Fix835769(), llvm::createAArch64A57FPLoadBalancing(), llvm::createAArch64AdvSIMDScalar(), llvm::createAArch64BranchTargetsPass(), llvm::createAArch64CleanupLocalDynamicTLSPass(), llvm::createAArch64CollectLOHPass(), llvm::createAArch64CompressJumpTablesPass(), llvm::createAArch64CondBrTuning(), llvm::createAArch64ConditionalCompares(), llvm::createAArch64ConditionOptimizerPass(), llvm::createAArch64DeadRegisterDefinitions(), llvm::createAArch64ExpandPseudoPass(), llvm::createAArch64ISelDag(), llvm::createAArch64LoadStoreOptimizationPass(), llvm::createAArch64PreLegalizeCombiner(), llvm::createAArch64PromoteConstantPass(), llvm::createAArch64RedundantCopyEliminationPass(), llvm::createAArch64SIMDInstrOptPass(), llvm::createAArch64SpeculationHardeningPass(), llvm::createAArch64StorePairSuppressPass(), llvm::createAtomicExpandPass(), llvm::createCFGSimplificationPass(), llvm::createEarlyCSEPass(), llvm::createFalkorHWPFFixPass(), llvm::createFalkorMarkStridedAccessesPass(), llvm::createGlobalMergePass(), llvm::createInterleavedAccessPass(), llvm::createInterleavedLoadCombinePass(), llvm::createLICMPass(), llvm::createLoopDataPrefetchPass(), llvm::createSeparateConstOffsetFromGEPPass(), llvm::EarlyIfConverterID, EnableA53Fix835769, EnableAdvSIMDScalar, EnableAtomicTidy, EnableBranchTargets, EnableCCMP, EnableCollectLOH, EnableCompressJumpTables, EnableCondBrTuning, EnableCondOpt, EnableDeadRegisterElimination, EnableEarlyIfConversion, EnableFalkorHWPFFix, EnableGEPOpt, EnableGlobalMerge, EnableLoadStoreOpt, EnableLoopDataPrefetch, EnableMCR, EnablePromoteConstant, EnableRedundantCopyElimination, EnableStPairSuppress, llvm::TargetMachine::getOptLevel(), llvm::getStandardCSEConfigForOpt(), llvm::MachineCombinerID, llvm::CodeGenOpt::None, llvm::PeepholeOptimizerID, and llvm::SystemZISD::TM. 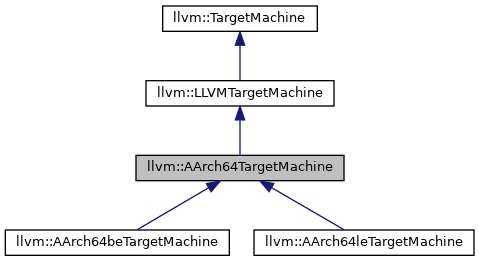 Definition at line 48 of file AArch64TargetMachine.h. Definition at line 294 of file AArch64TargetMachine.cpp. 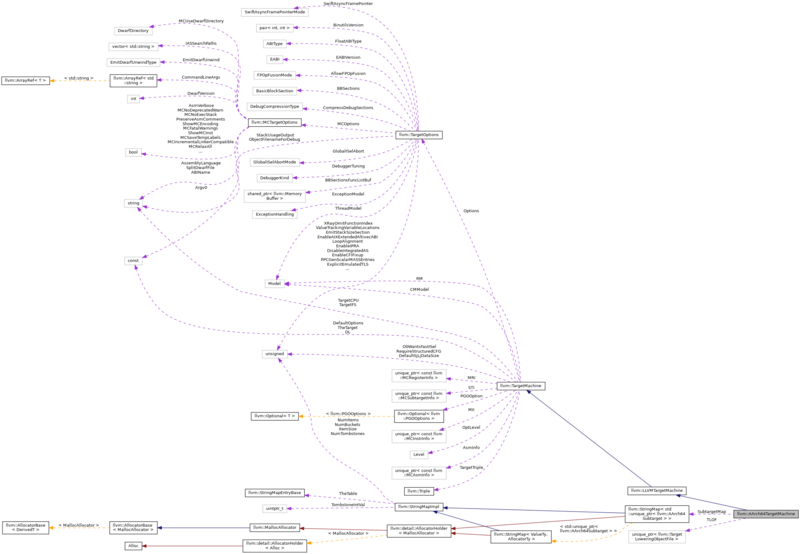 References llvm::Function::getFnAttribute(), llvm::Attribute::getValueAsString(), llvm::Attribute::hasAttribute(), I, llvm::Attribute::None, llvm::TargetMachine::resetTargetOptions(), llvm::StringRef::str(), SubtargetMap, llvm::TargetMachine::TargetCPU, llvm::TargetMachine::TargetFS, and llvm::TargetMachine::TargetTriple. The TTI returned uses the common code generator to answer queries about the IR. Definition at line 394 of file AArch64TargetMachine.cpp. Definition at line 28 of file AArch64TargetMachine.h. Definition at line 27 of file AArch64TargetMachine.h.